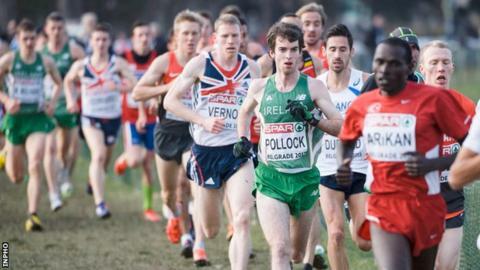 Belfast athlete Paul Pollock came in 23rd in Sunday's European Cross Country Championship in Bulgaria. The Annadale Striders runner was the best of the Irish competitors in the men's senior race. "I started slowly - I would have liked to finish higher up, but I can't complain considering where I was six weeks ago," said Pollock. Fionnuala Britton, who was sixth in the individual race, led Ireland women's team to the bronze medal. Two-times European cross country champion Britton failed to make the podium and slipped back to sixth position in the final lap in Samokov. Britton's disappointment was forgotten about minutes later when Letterkenny's Ann Marie McGlynn came home in 46th place to give Ireland bronze, just one point clear of France. "I really can't believe this" smiled McGlynn. "I really thought we could get a bronze if we packed together and if Michelle Finn stayed up high." "We were really up for it but we didn't say it publicly too much, I had a feeling, I really did." Ireland secured the bronze with Britton (sixth), Sara Treacy (12th), Michelle Finn (23rd) and McGlynn in 46th combining to ensure that they pipped France by one point. Britton, who was aiming for a third individual senior medal, was in contention for bronze with defending champion Sophie Duarte. Britton and Duarte were overtaken by Sweden's Meraf Bahta and Belgium's Almensch Belete and she had to settle for sixth place. "All I could think was you have to keep fighting for the team" admitted Britton. "It was so frustrating not catching Sophie but I knew I had to do it for the team." The team race saw Great Britain take gold, Spain winning silver and Ireland claiming a bronze medal in an event they won in 2012. Ryan McDermott of Annadale Striders was unable to finish the men's under 23 race as he was unsettled going into the race.